I would just like to say that trying to pee in these heels proved to be a difficult task. As the toilet seat became a significant distance from my bum, I suffered a mighty crash landing, causing others in the next stall to ask if I was alright. Followed by the ever clever, and never-ever old, hand-washing and not having anything to say joke, "Hey. Did everything come out alright?" I love public restrooms. LOVE them. Anyway. The shoes made up for it. Cause they're beyond comfortable. And of course, ridiculously good looking. Anddd they made a girl cat call me down the hallway, "Work those spicy heels girrrrl. Ow!" My shoes are winning. you look so cute!! i i love how all you photos look sooo amazing beautiful and so sharp!! just became your new follower! "In other bathroom news, we had Chinese the other night..."
Those shoes are definitely sassy! This post made me laugh, I'm one of those that laughs hysterically at bathroom humor. Hi, I'm 5. You definitely deserved that cat call, the shoes are truly spicy! Those shoes are beyond fab!! At my height, wearing those might actually make me average height! haha! I've got some shoes like that on today too...good luck with the rest of the day! Hahaha! I love your honesty here! Those shoes are spicy hot! Wood platforms are my favorite trend right now! You are killing me with not telling your summer plans! Every post I think you are gonna say what they are, but you never do! It's like saying "I have a secret! I have a secret!" and not telling. But I'll forgive you since those shoes are so hawt. I love the gingham. Its so bright & fun. And the crash landing...has totally happened to me when wearing sky high heels! goodness me, that story is most definitely worthy of an awkward & awesome thurs post. but it's both awkward..and awesome...so i'm not sure in which category it'd fall. regardless, glad to have it here on tuesday nonetheless. Just came across your blog for the first time. Love it. Adorable! I'm LDS too :) Have a good day! hahah ohhhh public bathrooms. bleh. just marked this post on my pinterest because of your hair. are you using a little rubber band to hold your bangs/hair back like that? i keep trying to do something similar with bobby pins, but it NEVER works out. Too funny. That jacket looks great. Heading over to check it out now. Ah! I love this. And yes those heels are spicy! You crack me up! Love those shoes. haha too funny! public bathrooms are so awkward in the best way possible. cute plaid shirt, and love the bag! Love the shoes and every bit of your outfit! You inspire me..
yet again i love love your outfit and that jacket is awesome. Oh my goodness I would have cat called you, too, because those shoes are *fierce*. Yes, I did just pull a Tyra. And don't worry I did the finger snap while sitting at my desk! I love those shoes AND that jacket. & you should give away another THEIT bag. Please? Kidding. But really. Public bathrooms are the worst. &. Question I always ask myself when I have to walk into one, let alone use one: Why are they always wet? The floor. The ceiling. The counter tops. The doors [ew]. Everything's always sopping wet. Like the bathroom was just visited by team of firemen with their super charged hoses. Gross. You are by far the funniest blogger ever. Love those shoes! And I've definitely had that problem with peeing in heels. always so stylish! and what a hilarious story, classic! have a lovely day! love the shoes. love them. want them. You are hilarious. I love that you always allude to how funny you find bathroom humor, but never say too much. Kills me! Those heels are amazing! So summery. Love when you wear your checkered shirt!! You are featured in my recent blog post too!! Shoes and bag are perfect love them! Your stories are always so hillarious, Syd! Haha! Oh, I bet dozens fashionistas feel for your pee-in-heels story! Such a cute outfit - I want that jacket! Can't stop laughing your stories are always hilarious! Those shoes are worth the awkward moment, you can add that on Thursday! Jacket is cute too! so true and so honest! I love it! hhah. I LOVE it when people give shoe compliments. I was wearing my boots one day at work and this guy was like "I like your boots, they're really cool." HAHA lady you make me laugh, those shoes are worth it though. They are gorge. i almost dropped to the ground laughing, you are soooo funny! i had chinese for lunch! Hi Sydney! Love your watch - i scrolled back through recent months to see if you ever labeled where it was from, but no luck. Do you mind sharing? and i love the heels. Hey Ma'am! LOVE those shoes! They come in a FABULOUS green color, too! I just happened to blog about them yesterday! man i want those black pants of yours so bad - but they only have size 15! agh! I love the whole outfit, especially the bag and coat! Love the shoes even if they can be a little troublesome!!! They are worth it! Great outfit! those shoes are spicy. love it! i'm guna have to start using the word to describe awesome stuff. it makes me feel latino. I feel like I desperately NEED that bag...maybe an exaggeration but it's just how I feel!! those shoes are hotter than life!! haha :P i think i would have the same problem with those heels! But they are beautiful! Love the shoes!!! they are pretty great! hehe yes work those heels girl! they are adorable!!! Very cute outfit and I have to agree that the shoes are worth all efforts. This post was fantastic. So much bathroom humor, and spicy heels. Leaving the House in THIS?!?! New follower :) Please stop on by..
Don't worry about the fall. Still gorgeous! ;) Your posts always crack me up. One of my favorite bloggers, definitely! Love your jeggings, btw. Fits so perfectly! Great outfit Syd! Note to self: must buy those shoes! Ha ha! So true! Gotta love public washrooms and giant heels! LOL your shoes are "winning". love it! Super look. Love the checks. The blue pops so bright. The shoes are incredibly great. You're too funny. I hope you didn't get a bruised be'hind. Love the shirt and jacket, very cute! hahaha..unfortunate incident with the bum. Love your outfit! oh you didn't know that was me cat calling? funny cause i swear it would have been if i had seen those shoes walk by... holy moly!!!!! hot mama! yep, need those. ahhhh cracking up that you fell over / down in the restroom because this has totally happened to me before! and Seychelles really makes the most comfortable shoes; it got a pair of boots from this brand from hallelu boutique online and love them! love the outfit the shoes are amazing! that bag! I want it! I love the whole outfit! very Cute! So adorable! I love how you always look so happy in your pictures...bet you're a blast in person! Oh my!! 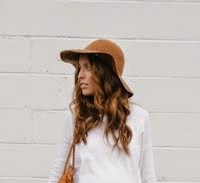 You are gorgeous and I'm loving your blog! Have a fun trip..and an even funner trip to vegas with your husband!